A lot of people don't know that I am an avid vintage doll and book collector. I especially love to collect vintage barbies and fashion dolls from my childhood (late 70's early 80's.) The books I like to collect are children's books and vintage Bibles and Bible Story books. I am getting quite good at identifying valuable dolls and books and usually scour antique shops in search of these treasures. During our recent trip to East Texas, Jefferson specifically, we wandered into an antiques' shop and as I was meandering around I came across a basket full of old Barbies. I knelt down to look through the basket which was marked $3 each. At the bottom of the basket I saw two fashion dolls, not Barbie, but fashion dolls that looked like they were from my era. I picked them up and saw that they had no marks on the bodies and they each looked to have the original outfits on. I couldn't recognize the dolls but I pulled up the clothing and read on the back of one "Kenner Toy Company 1978". BINGO!! I was buying this doll. The next one, said "Ideal Toy Company". I bought both for $6.00. 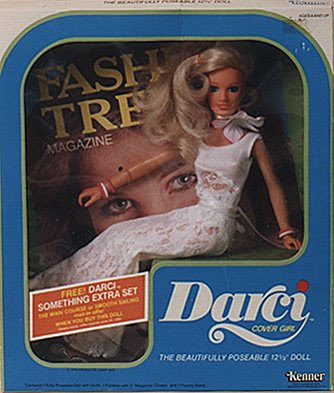 As I researched these two dolls I came to find out that the 12.5" doll is called "Darci" and she was created to be a direct competition for Barbie in the mid to late 1970's. The Darci I have has her original bathing suit and bangle bracelets. She was also dressed in some other clothing which I believe to be original as well. She is worth about $20 since she is out of the box. Not bad huh? The second one is called Tuesday Taylor Supermodel. She is worth about $25 out of the box. She was also a competitor to Barbie. The original, and older, Tuesday Taylor doll had interchangeable hair. Mine does not but is valuable nonetheless. I am happy to have found such "treasures" that maybe one day I can share with my granddaughters. The Bible Storybook I got for $1.99 is from 1935 and was published by Rand McNally. There is an inscription inside that says "Merry Christmas, 1941." I think it's so cool to be able to hold toys and books that children have treasured and played with in the past. It brings such nostalgia for me. It reminds me of simpler times. Times of great imagination and wonder. I loved being a little girl and playing Barbies. I loved my dolls. I still do. WOW how neat! I had no idea you had this little hobby. I loved reading about it! I would love to see your collection some time!